Could the Bulldogs get the top seed in the College Football Playoff? The College Football Playoff selection committee has some work to do on Sunday. Forget about what to do with the No. 4 seed. Who should be No. 1 could be the stronger debate. The Georgia Bulldogs effectively punched their playoff ticket for admission to this season’s national championship tournament with a 28-7 victory over No. 2 Auburn on Saturday in Atlanta. 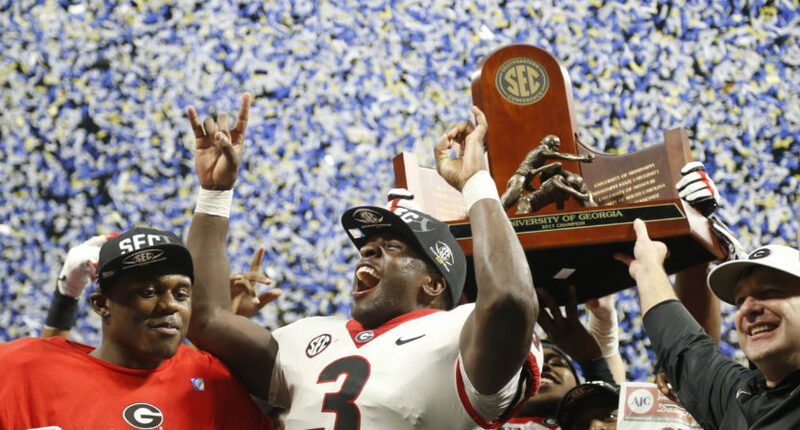 By virtue of getting their revenge on the only team to beat them this season, Georgia has now defeated every team on their schedule and won the SEC championship with just one loss. Do they have a legitimate case to be the No. 1 team when the selection committee reveals their final four on Sunday? As far as wins are concerned, Georgia has plenty of them with a 12-1 record highlighted by a road win against Notre Dame and including wins over two SEC teams that have been well-respected by the selection committee over the last month: Mississippi State and Auburn. Georgia has also beaten three bowl-eligible teams from their own division, and the co-champions of the Sun Belt Conference, Appalachian State (for whatever that is worth). That’s not bad, especially with Auburn being beaten by Georgia when the Tigers were ranked No. 2 in the selection committee’s playoff ranking. But how does that stack up with the case for No. 1 that will be pitched by Clemson or Oklahoma? Not quite well enough. Clemson routed the No. 7 Miami Hurricanes in the ACC championship game and stocked up on top 15 wins back in September against Louisville, Virginia Tech, and Auburn. The Tigers scored two of those wins on the road, and took down NC State in Raleigh for another top 20 win. They also defeated Georgia’s top threat in the SEC East, South Carolina, by 24 in the regular season finale for another top 25 win. Dabo Swinney’s team has a stronger case for No. 1 than Georgia except for one key data point. Clemson’s loss at Syracuse is still a worse loss than Georgia’s lone loss on the road at Auburn. But how much credit do you get for revenge? And keep in mind how much of a pass the committee has given Clemson for losing that game to Syracuse. Think that’s going to change now? Not a chance. What about Oklahoma? Georgia may have an argument. Oklahoma has two wins against top 10 teams this season, including one true road win against the Big Ten champion Ohio State Buckeyes, but one of those top 10 wins came against the same TCU team (ranked No. 11) they just defeated for a second time. The Sooners also have a win against Oklahoma State on the road. The lone loss argument? That favors Georgia once again, with Oklahoma losing at home to a better-than-expected Iowa State team. Wherever Georgia is seeded is really irrelevant. Whatever the seeding may be, and whoever they get matched up with, Georgia will be a force to be reckoned with in either the Rose Bowl or the Sugar Bowl. Contributor to NBCSports.com's College Football Talk, Athlon Sports and The Comeback. Host of the No 2-Minute Warning Podcast on iTunes, Stitcher Radio and iHeart Radio. FWAA member and Philadelphia-area resident.